With all the OTA's taking place in the NFL the past few weeks, it's a sure sign that preseason training camps will be here before you know it. 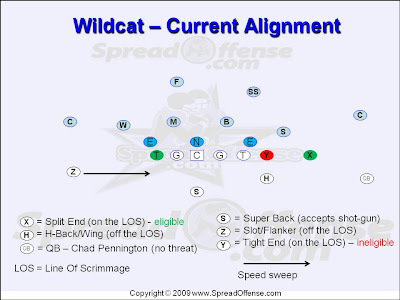 As a blog dedicated to the spread offense, I thought I'd let the coach in me take an educated guess at what Dan Henning, David Lee, and George DeLeone are cooking up in the laboratory down in South Florida for 2009 as it relates to the 'wildcat' formation and their new player, Pat White. Now I'm not claiming to be smarter than Gus Malzahn and David Lee who ran this offensive set very successfully at Arkansas with Darren McFadden and Felix Jones, but I see some real limitations here that can be improved upon, now that you have a dual threat QB like Patrick White who can get into the shot-gun. 1) Strictly related to personnel (nothing to do with the formation itself), with White in the huddle, you will no longer require Chad Pennington to be on the field, which was no threat at all to the defense (though, he did throw an easy reverse pass touchdown out of the wildcat in a game last year, but that play is not a sustainable threat at this stage of the evolution of the formation in the NFL). Remember that White can easily get under center and run the Dolphins 'regular' offense, which is what he's learning now in mini-camps, OTA's, and eventually preseason camp. So in that case, the defense can't 'assume' White is coming out on the field just to run the wildcat or a spread offense. With Pennington not on the field, you now add another 'athlete' to the offense, someone who can catch the ball, block well on a run to that side (we all know in the spread offense how important stalk blocks are for breaking long runs or screens), and run a reverse/mis-direction play. 2) The 'Y' or Tight End not being an eligible receiver is a crutch in the current wildcat formation. I fully understand the 'over' or unbalanced concept, but trust me the likes of Bill Belichick and Rex Ryan are in their lab's too... sniffing out every weakness and leverage point against the current set. I feel a more 'balanced' formation that allows for equal playmaker's across the entire 53 yards of the field will help this offense, and accent Pat White's skills, as well as the rest of the skill players on Miami. Note: One play that really caught the Pat's off guard last year was when the Dolphins put Anthony Fasano (TE) at the eligible Tackle position in the current unbalanced wildcat, and sent him on a corner route where Ronnie Brown hit him for an easy touchdown. Lets take a look at what could possibly become 'Wildcat 2.0' in 2009. In the above formation diagram, you'll notice a more 'balanced' set, and the thing I really like about it is it makes Ronnie Brown (H), Ricky Williams (Z), the flanker (FL), the X and the Y (TE) all threats on every play. I would call this a 'TE-trips - open, empty' formation if I was still coaching, and one that can accomplish a lot of great things. First thing is you can motion either Williams or Brown (speed or jet motion) in this set to create mis-direction or simply zone read with White of the mesh (Did you say 'Zone Read' in the NFL!) - Ya, you have the all-time NCAA leading rusher as a QB in the backfield with two seasoned running backs who want to take this thing to the next level... and Ricky Williams really impressed me with how he carried out his run fakes last year in the wildcat, these guys truly love it! And the pass game, look at the horizontal balance now for White to shoot a ball out to Ted Ginn Jr. or the many other talented receivers on Miami. 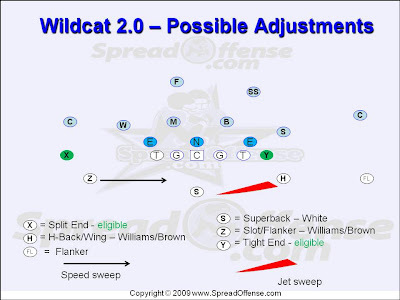 Only time will tell, but my impression of wildcat 2.0 should make the Miami Dolphins (or any other team wanting to balance out the traditional wildcat) more effective in 2009. Spread Offense Playbooks - Download Now! T-Shirts, Hats, and Mugs from SpreadOffense.com - Show Your Support of The Spread Offense! Come visit our SpreadOffense.com online store!